If you’re planning to try to sell your home any time soon, these 7 affordable home improvements will make it more appealing to buyers by increasing the curb appeal and giving you the opportunity to sell it more quickly. With interest rates at an all time low and a lot of home inventory on the market, anything you can do to increase the curb appeal of your house for the least amount of time and money, can make a big difference! If you have cheap home improvement tips, please add them to the comment section at the bottom of the page. The front door is a focal point when viewing your home from the street and much like sprucing up your front porch, adds a big bang for your buck. If you’re working with a tight budget, paint the door. 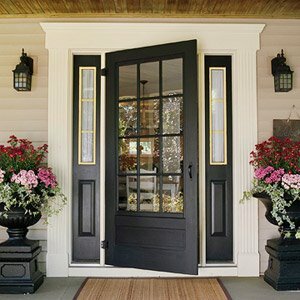 If you’ve got more to invest, choose an attractive door to complement you home’s exterior. A fireplace is a focal point inside the home, but if the outside is cracked, doesn’t have a Chimney cap or worse… bricks are starting to pop out, the focal point becomes an eyesore! Spend an afternoon on Chimney Repair, it’s cheap, and can only help it sell quicker. Old bushes make a home look dated. Out with the old and in with the new! Choose young, vibrant shrubbery that gives the front of your home a lively, fresh look. If you can, hire a landscaper to add some young flowering trees around the yard for a summer sale or young hardwoods that will turn colors in the fall for an autumn sale can be a real boost too. Consider adding a new flower bed and planting some fall flowers; or revitalize old beds to help liven up the front of your home. Flowers are very inviting, so add a few pots or hanging baskets loaded with flowers to the front porch as well. Depending on the condition of the driveway and your budget, do what you can to improve its looks. Consider resurfacing the driveway if that is a possibility. If not, an asphalt driveway with a fresh coat of black sealer on it looks fantastic and lets potential buyers know that it has been well-maintained. For more info about driveway replacement costs and more, the Driveway Guide has a library of stuff you can do to freshen up the road into your home. If your home doesn’t have shutters, installing them will add interest. If you have shutters and they’re outdated or worn, consider replacing them or repainting them. If your garage door faces the road, give it a fresh coat of paint. Quality paint can be found at the home improvement store (Lowes, Home Depot) for all types of garage doors – wood, steel and aluminum. The trick is to buy the right kind of exterior paint, made specifically for steel or aluminum. For spots that need repair, treat it just like a car, and sand down, repair and re-primer the area before painting. Flowers and flowering shrubs are great if your home is on the market in the summer months. An attractive rock garden looks good throughout the year. Rocks and flowers are a great combination too! House and Home has a great page full of details for building your own rock garden. 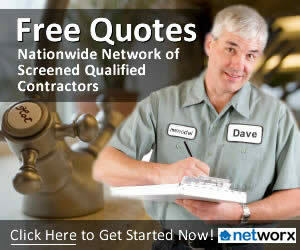 A great read for everyone considering this type of home improvement. You don’t have to break the bank to give your home more curb appeal. These 7 home improvement projects to help you sell your home faster should prove to be a good investment when you put it on the market.